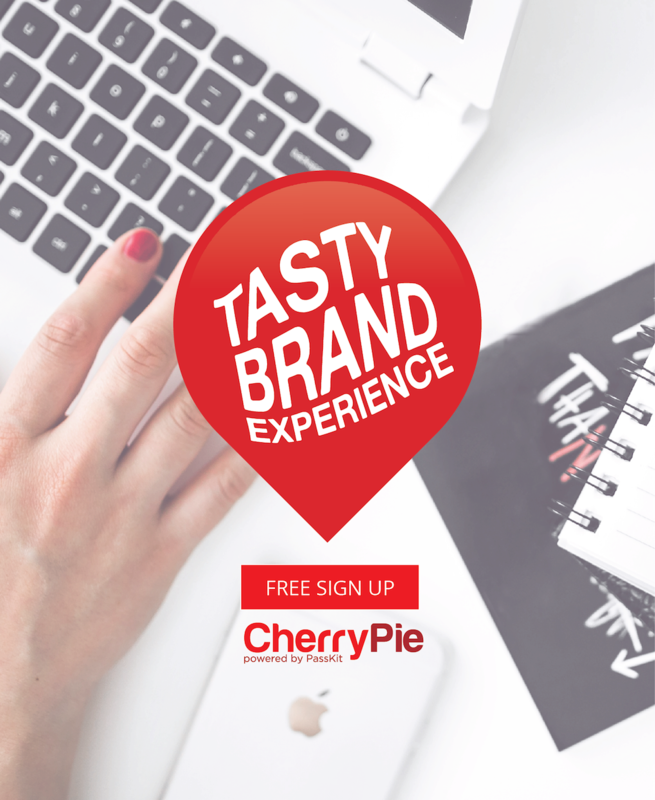 Once you’ve created your pass for mobile wallet on CherryPie you can choose whether to distribute it on Apple devices, Android devices, or both. There are several wallet applications that users can choose from, but in this post we will focus on the main differences and similarities between Apple Wallet and Android Pay. We will take a look at layout differences first, and the technical features afterwards. If you are not familiar with mobile wallet technology in general, I would recommend to sign-up for our free 9 days Mobile Wallet and Proximity Marketing email course. Pass colour: in Apple Wallet the pass colour can be fully customised. In Android Pay, the colour is automatically captured by Google from the logo and it can not be changed. Pass shape: Apple Wallet passes have a front and back of the pass. The front of an Apple Wallet pass is the size of the smartphone screen and cannot be scrolled. The back of an Apple Wallet pass has unlimited length and can be scrolled. Android Pay passes are not two-sided but the content can be scrolled (i.e. the single sided pass does not have to fit into the smartphone screen). Links: Useful and personalised links, to URLs, maps and telephone numbers for example, can be displayed on the both back of the Apple Wallet pass and on the Android Pay pass. The links are displayed slightly differently on iOS and Android, and there are a few more constraints on the type of link, and how it is displayed on an Android Pay pass. Push Notifications: in Apple Wallet notifications can be sent and occur within seconds. In android Pay Push notifications can be sent, but Google warns they may be delayed up to 24 hours. GPS location messages: in Apple Wallet GPS location messages can be fully customised. In Android Pay GPS location messages are defined by Google and cannot be customised. Beacons: Apple Wallet is designed to work with beacons (specifically the iBeacon protocol). Apple Wallet makes relevant passes immediately accessible when in proximity to the beacon by integrating them with the lock screen. Android Pay does not currently integrate with Google’s beacon platform. 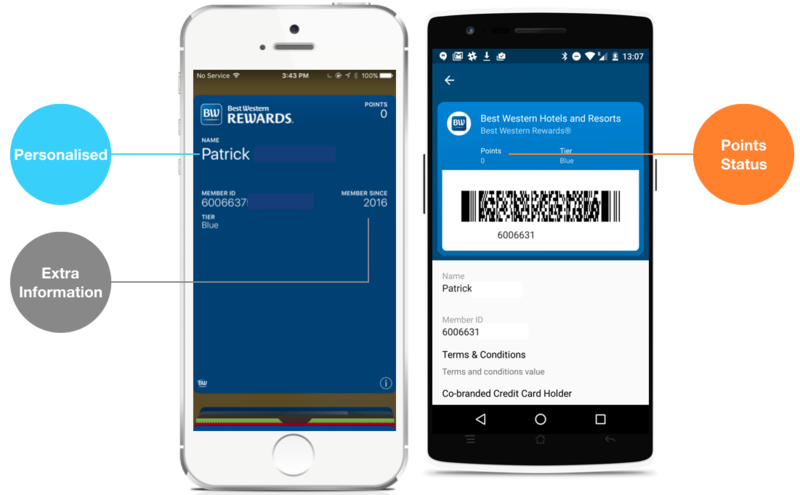 NFC: both Apple Wallet and Android Pay support NFC. Dynamic content: both Apple Wallet and Android Pay can deliver personalised dynamic content to the user. 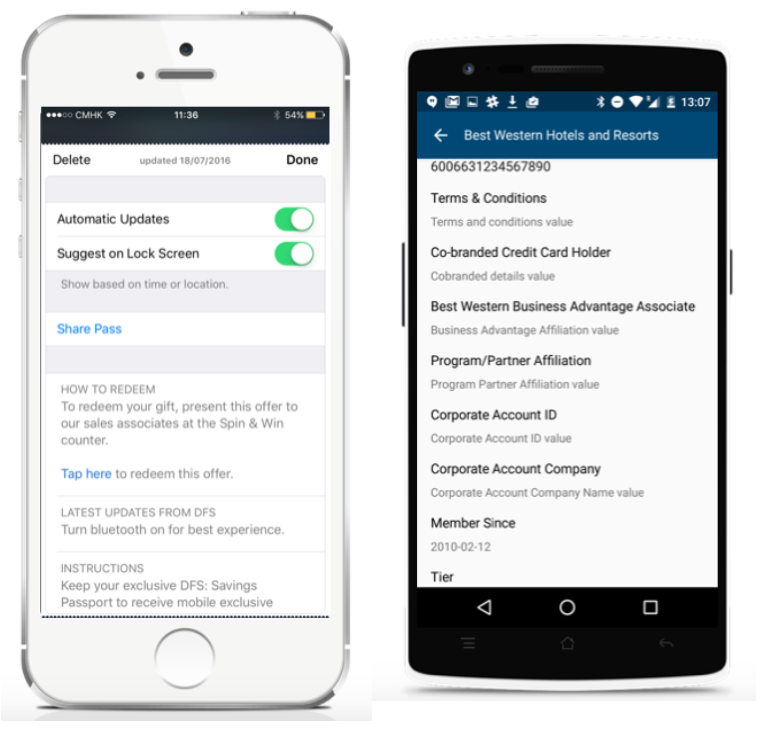 Real-time engagement: both Apple Wallet and Android Pay support real-time engagement, for example points status updates immediately as points increase. In the picture below you can see how the same pass looks like on Apple Wallet (on the left) and Android Pay (on the right). The digital content in the example below is a digital membership card for Best Western Hotels. Apple Wallet is widely spread worldwide (> 1 billion phones) and it’s also native in Apple devices. 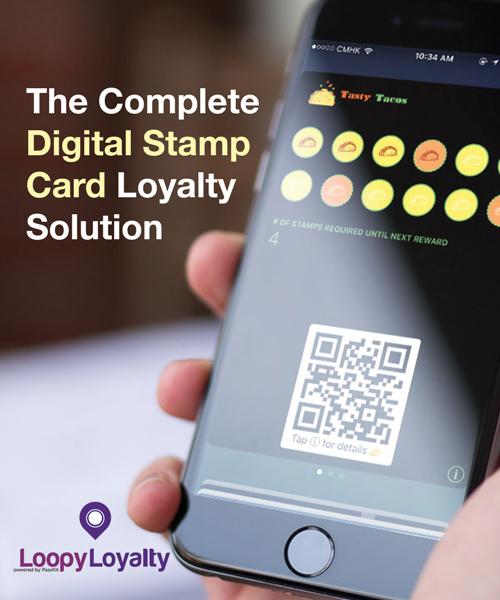 It includes NFC capabilities and enables payments through Apple Pay. Transactions security is guaranteed by password or touch ID. In terms of localisation, Apple Wallet is available in 35 languages, meaning the wallet content can be displayed in the user’s language. Android Pay is currently available in the United States, UK, Ireland, Poland, Singapore, Australia, Hong Kong and New Zealand. Android Pay is currently only available in localised English. As well as Apple Pay, Android Pay also leverages NFC technology for payments. The wallet data is stored in Google servers, whereas Apple Wallet content is directly saved in the phone. Security of transactions is guaranteed by password or touch ID. Languages: Apple Wallet operates in 35 languages. Android Pay currently operates only in localised English, although it may support French when Android Pay launches in Canada. Availability: Apple Wallet is available worldwide. Android Pay is currently available in United States, UK, Ireland, Poland, Singapore, Australia, Hong Kong and New Zealand. Security features: For both Apple Wallet and Android Pay security is enabled through Fingerprint ID and password. Data Storage: Apple Wallet doesn’t need server storage as pass content saves in the phone. On Android Pay the pass data is stored in Google servers. Look and feel: Apple Wallet passes can be flipped and display content on the back, Android Pay passes only have the front. Install rate: Apple wallet is a native app and it can not be deleted. This means 100% of Apple devices have Apple Wallet. Android Pay is not pre-installed so it is available only after download. Barcodes: both Apple wallet and Android Pay support 1D and 2D barcodes. The picture below shows the back of an Apple pass (on the left) and how additional information is added on the front side of Android Pay passes (on the right), as Android Pay passes don’t have a back side. This is the end of the article, but before you leave I’d like to recommend a couple of things. If you liked the post, please let us know what you think in the comment section below. Also, if you want to get your business on your customers’ phones you can begin creating your campaign here! Lastly, please feel free to get in touch with us if you have any questions or if you want to leave any feedback!